How do we know the stars and galaxies are made of the same stuff that we are made of here on Earth? “Because science” – specifically, spectrography, chemistry and quantum physics. This sounds as though it could be complicated, but conceptually, it’s a few simple steps. The conclusion is that the whole of the known universe is composed of the same elementary particles, chemical elements and types of radiation throughout. There is still a list of astronomical unknowns, however – dark energy and the source of high-energy cosmic rays (actually ultra-high-energy charged particles), to name just two. But the deduction that the entire universe is homogeneous in its constituent parts is one of the greatest intellectual achievements ever. Sir Isaac Newton was the first to demonstrate that white light is composed of the various colors of the rainbow. Refract light through a prism to separate it into its constituent hues. By placing a second prism in the path of the refracted light in different ways, he showed that the colors can be reconstituted into white light, and a monochromatic component from the first prism’s spectrum cannot generate other colors. Thus, white light is not changed into colors by refraction. Instead, white light is composed of different colors of light. We understand now that each color represents a different frequency of electromagnetic radiation that is visible to us. where h is Planck’s constant. Energy is measured in joules or ergs; frequency is measured in hertz. Because each photon carries a minute amount of energy, Planck’s constant is minuscule. When the light emitted by hot matter is refracted, one obtains a continuous spectrum of colors with varying intensities (see figure). 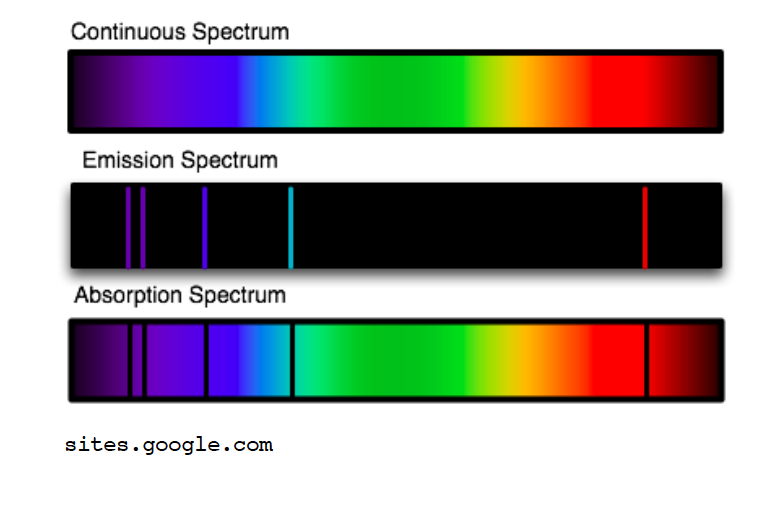 Low-pressure gas (of one element) that’s excited by heat or collisions with electrons produces a spectrum with emission lines: most of it is dark, but for a finite number of bright emissions of specific colors at their corresponding frequencies of radiation. In the mid-1800s, physicist Gustav Kirchhoff and chemist Robert Bunsen first observed emission lines in the spectra of heated elements. They demonstrated that each element has its own unique set of emission colors, or frequencies. It’s a signature. The stimulated atoms of the element emit photons only at certain frequencies and none elsewhere. Observations by chemist William Hyde Wollaston earlier in 1802 showed that the bright spectrum of the sun contains dark, narrow gaps called absorption lines. Many of the observed colors of absorption line up exactly with elemental emission lines observed in the laboratory. These absorption spectra from the sun are theorized to be signatures of specific elements present in the atmosphere of the sun. They result when cooler gas in the photosphere of the sun absorbs the light emitted by the hotter surface, but only at specific frequencies. Some of the elements observed in the sun include hydrogen, helium, oxygen, carbon and iron. By matching the absorption signatures from the sun with emission signatures from the laboratory, we know that the sun’s atmosphere at least is made from the same elements found on Earth. When the spectrum of the light from stars and far-away galaxies is captured, we find the same absorption and emission signatures as those seen from the sun: signatures of the same elements we are made of. It appears that the whole of the universe is composed of the same elements throughout. It may not appear so from looking at the night sky, but everything in the universe is moving relative to everything else. If you’ve heard of the Big Bang, then you know the universe is expanding – and at an accelerating rate to boot. Galaxies far away are typically moving away from us, the observer, at great speeds. Light emitted by a luminous astronomical object moving quickly away at one wavelength will be observed as a longer wavelength, or lower frequency of light. It is red-shifted because the frequency is shifted toward the red end of the visible spectrum. All emission lines from all elements present are red-shifted a proportionate amount. The amount of red-shift in the emission/absorption lines indicates the object’s receding speed. If the luminous object happens to be moving toward the observer, the frequencies are blue-shifted, indicating its approach speed. Why do atoms emit and absorb only specific frequencies of light? Quantum physics. A photon of light is created when an atom-bound electron at one energy level drops to a lower energy state, in an instant releasing one quantum of radiation. The amount of energy released is equal to the electron’s energy drop in the atom: the difference between the starting and ending energy levels. An electron in an atom of a particular element can assume only a finite number of energy levels; therefore, the atom can release photons only of certain energies. Referring to the equation, we deduce that the atom can release photons only at certain frequencies. Hence, emission lines in the spectrum. When an atom absorbs a photon, an electron jumps up, but only to one of the predefined energy levels. Because the energy absorbed must equal the energy difference in the electron transition, an atom of a specific element can absorb only certain frequencies of light. Hence, absorption lines in the spectrum. The discussion here would tell us that our color spectrum should be limited, but an infinite number of colors seems to exist in our visual universe. This is because there are many different elements, each with a unique set of electron energy states and many different kinds of compounds that can affect the energy levels in the constituent atoms. Also, even though light at the quantum level must be of a specific frequency or color, it is mixed in myriad ways, and our perception of color apparently can average out the individual frequencies into a multitude of hues. It’s hard to believe that underlying everything in the universe is the bedrock of physical reality, quanta of matter and energy, elementary particles and photons of radiation. “Eye On the Night Sky” is a monthly column by the Door Peninsula Astronomical Society. For more information on the organization, visit DoorAstronomy.org. How, On Earth, Do We Measure the Universe?